I wrapped up the linux+ and started studying for the sec+ just to realize I was incredibly bored with it. It’s not challenging what-so-ever so I hit a bit of a wall on what to do next. I’ve been putting off coding for a long time, and I think it’s time I gain some proficiency. Going forward for a bit it’s likely going to be more snippets in the direction of automation, and a bit of python. I hope to get far into API integration if I can build up a strong core here. The intention is to start building a github portfolio as well. 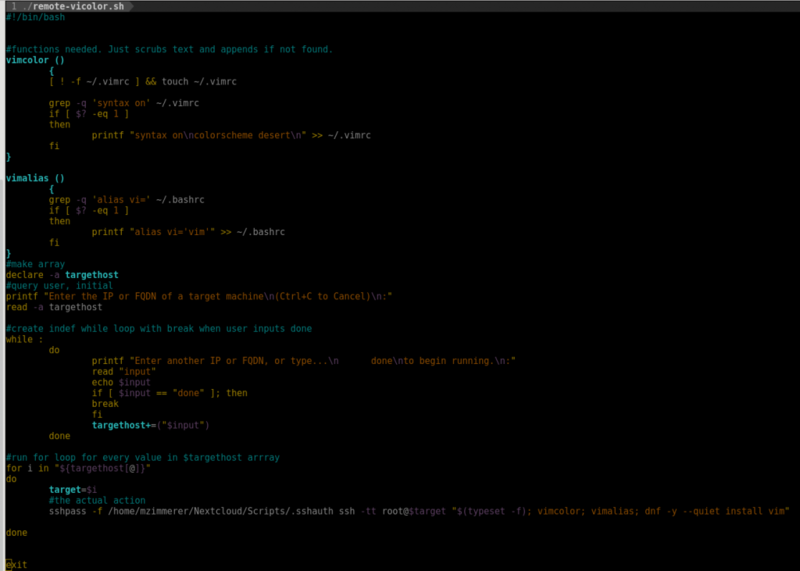 This blob is just a quicky so that I could enable vim colors on all my shells. I had also set an alias on my servers for vi=vim as well. Not much to it, but it’s a start. Yes I log into my home servers as root. blob below, but wordpress because wordpress doesn’t handle indents well. #functions needed. Just scrubs text and appends if not found. printf "Enter the IP or FQDN of a target machine\n(Ctrl+C to Cancel)\n:"
printf "Enter another IP or FQDN, or type...\n done\nto begin running.\n:"
sshpass -f /home/mzimmerer/Nextcloud/Scripts/.sshauth ssh -tt root@$target "$(typeset -f); vimcolor; vimalias; dnf -y --quiet install vim"